Broad strokes of bright blues that define lake and sky, swaths of emerald green pine trees, purple-tinged boulders—these vivid and confident interplays of color define the works of impressionist painter Nick “Sninkelletti” Hinkell. Sninkelletti, a resident of Minden, Nevada, grew up in the small Sierra foothills town of West Point. During his childhood, he spent considerable time with his grandmother, an impressionist who taught him to “see like an artist” and helped him understand that staying inside the lines is less important than creating a feeling of space and light. He originally aspired to become an animator, spending countless hours drawing cartoons. “It was only after visiting MGM Studios and seeing how impersonal the job would be that I started looking at other options,” says Sninkelletti. To that end, Sninkelletti, now 32, attended UC Berkeley and pursued an engineering degree. However, at the end of those four years—following several episodes where he lost consciousness—doctors discovered a chicken-egg-sized growth on his brain that was putting significant pressure on his right temporal lobe. “It was benign tissue, nothing particularly dangerous, but the brain didn’t like it there,” he says. Meanwhile, Sninkelletti began distancing himself from the logical, analytical world of engineering. “I remember a particularly long day working at the Contra Costa Water District as an engineering intern staring blankly at the computer screen and thinking ‘I wish I was snowboarding,’” he says. That same day in early 2005, possibly on a right-brain impulse, he quit his job and moved to Tahoe to become a snowboard instructor. When the snow melted, he needed a summer job to remain at The Lake. A roommate suggested a local art gallery. Sninkelletti, an avid art enthusiast (he currently has 78 pieces of artwork hanging in his 950 square foot apartment), had begun painting again and thought it sounded like a good fit. He got the job at South Lake Tahoe’s Oh My Godard Gallery, which Wyland Gallery co-owned, and bounced between the galleries for two years. In his off-time, however, he often found himself drawn to the nearby Marcus Ashley Gallery, where he admired artists like abstract expressionist Michael Flohr and wandered among the large collection of Dr. Seuss illustrations and Unorthodox Taxidermy pieces. In the summer of 2008, Sninkelletti began working at Marcus Ashley, an ideal setting for an aspiring artist. In addition to submersing himself in the works and creativity of others, Sninkelletti often receives feedback and constructive criticism of his own work. 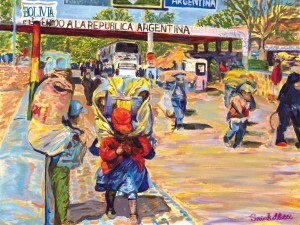 Many of Sninkelletti’s landscapes feature the Tahoe area—the greens, blues and blacks of Emerald Bay under a full moon, the many hues of Sand Harbor on a bluebird day, the bright, tumbling waters of high-mountain streams—yet it was a painting he created from a picture taken on the Argentina-Bolivia border that changed his life. The couple, who married in fall 2012, travel extensively. They hiked the Inca Trail to Machu Picchu, voyaged to see the penguins at the southern tip of South America and often backpack around Yosemite—and take thousands of photographs on their journeys, recording images that may eventually become lively, color-infused paintings. As for his name, Sninkelletti barely knew his biological father but inherited the surname “Hinkell.” His mother hyphenated it with her maiden name “Snead,” and “Pelletti,” from Sninkelletti’s stepfather. “My mom finally made up the name Sninkelletti to simplify Snead-Hinkell-Pelletti, and I thought that was much more fun, not to mention memorable,” he says. A memorable moniker for a memorable artist. Reno resident Alison Bender first met artist Nick Sninkelletti years ago at Marcus Ashley, when she was coveting a piece from Dr.